If you are like most people in the business world, then every day we race time to finish all the work and get our tasks done. One way of getting more time on our side is to properly manage it and take advantage of modern-day technology like Voicemail. I know I have. When I’m traveling away from home base, OneSuite’s SuiteAdvantage picks up all my messages. 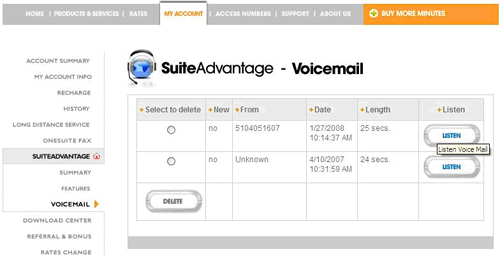 1.You may log onto your account and go to VoiceMail under SuiteAdvantage. Click to listen to any particular voicemail. Remember to clean your voicemail box afterwards since SuiteAdvantage allows for a maximum of 25 voicemails at one time. 2. Or, you may simply fire up your SoftPhone and dial *0. You may set up a password by pressing 0, then 5, then key in your password followed by the pound key. 3. Also, voicemails are sent through email announcements in real time as a wav file attachment, so you may access your email to listen to your voicemails. This feature is very useful so you never miss any voicemail as long as you are connected to the Internet. 4. Alternatively, you may dial your SuiteAdvantage number from any phone to get your message. Dial * at the end of the voice prompt, and enter the password required. Start using your voicemails and maximize your productivity at work. Instead of spending 15 minutes or more chatting on the phone, people can just leave their messages and save you maybe an hour a day. That’s an hour a day you can use for another project or to finish that report you need done ASAP. Nice to see you here again and thank you very much for the permanent link, I really appreciate it. 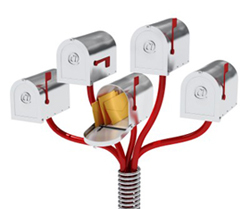 Tiny little mailboxes, aren't they're cute? Those are actually my OneSuite mailboxes in action. j/k. If you ever need some advice on VoIP, Long distance calls or what not, don't hesitate to ask.